The first few issues of Black Gate magazine have seen rave reviews from some of the most respected publications in the industry, including Locus, Interzone, SF Site, and many others. Here are some brief excerpts from some of the highlights. Where possible, links to the complete review are provided. Even Weird Tales wasn’t as good looking as Black Gate: Adventures in Fantasy Literature. Published and edited by John O’Neill, this beautifully produced, perfect bound quarterly included fantasy fiction by Mike Resnick, Darrell Schweitzer, Brian McNaughton, Michael McLaughlin, Tina L. Jens and Cory Doctorow, along with reviews, columns, and excellent interior artwork from Chris Pepper, Denis Rodier, Bernie Mireault, Richard Corben, Gabriel Morrissette, and Chuck Lukacs. Black Gate is comparable in quality to Realms of Fantasy… it is an impressive fantasy magazine. Black Gate, the new large format fantasy magazine, managed two fat issues [in 2003]. Although ostensibly a fantasy magazine, they remain very broad-church in their definition of fantasy, but the magazine did feature good stories this year, whatever you define them as, by Ellen Klages, Mike Resnick, Cory Doctorow, Bill Johnson, Gail Sproule, and others. An exorcist in Ancient China stumbles across far more than he bargained for… an escaped serf in a world of dangerous dimensional portals learns that fortune indeed favors the bold… an aging monarch receives the potentially lethal gift of a slave girl, the last living child of a dead Mage King… and a young man leads a ragtag band of soldiers to the surface to face the horrid invaders of Earth for the first time in millennia. Our action-packed sixth issue contains new fiction from Mark W. Tiedemann, Rick Norwood, Iain Rowan, Karen Jordan Allen, and the novel-length pulp reprint “Tumithak in Shawn,” the sequel to last issue’s epic “Tumithak of the Corridors” by Charles R. Tanner. All this plus the next hilarious installment of the Knights of the Dinner Table comic. Don’t miss it!. The centerpiece of the Fall issue of Black Gate is Mark Tiedemann’s impressive novella “Miller’s Wife.” Egan Ginter is fleeing another failed relationship in the big city; he hopes a couple weeks at a friend’s house in the Ozark town of Saletcroix will heal him. But something odd is going on — Saletcroix’s valley is dying, and a bad run of luck is plaguing the townspeople… Tiedemann maintains the suspense very well, and resolves the story just that little bit unexpectedly to make it memorable. Leading off is “Looking for Goats, Finding Monkeys,” by Iain Rowan… a well-written, atmospheric story with a wry voice and very fine characterization. Anne Sheldon’s “The Flowers on the Harp” …is a complex and poignant story that explores justice, mercy, and emotional cost as well as how age, experience, and insight alter even kings. Newcomer Kevin N. Haw’s delightful “The Grand Tour” takes a bunch of average American tourists and sends them to Hell for their vacation tour… The ending made me laugh out loud. Another good read is Karen Jordan Allen’s “Rocks Under Water.” Allen weaves the story tightly back and forth between the past and present… What happens is weird, exciting, and quite believable. A lot said in this short, visually intense story. Last up is Rick Norwood’s “Portal.” The central idea is particularly nifty: in Ian Smithson’s world, you can construct a portal between worlds very easily. Far too easily. When he does it as a small boy, his father, a serf (as is Ian before he escapes) punishes him severely to help him remember not to make portals — because the things that come out of them are usually deadly…. Portals, fights, soldiers all mix together. The portals are even weirder than you can imagine, and Norwood does a superlative job with them. The story has just enough resolution to tie off the main conflict, but there are so many tempting threads hanging loose that one hopes, very strongly, that Norwood is writing a novel to which this piece is the opening — or he will return to the adventures of Ian and Tod in a series of stories. “The Grand Tour” by Kevin N. Haw [reveals] Hell, like Eastern Europe, is having a currency crunch. So they’ve opened their gates for discount tourist packages. Still, it always pays to know your classical mythology. And don’t drink the water… Clever and short, this biting send up of American tourists abroad is sure to delight. [In] “Miller’s Wife” by Mark W. Tiedemann, Egan has borrowed a friend’s cabin for the weekend, or for however long it takes him to get his act together. But there’s something odd about the village of Saletcroix. Hard times have come and the villagers have an unusual justification for them. When the wife of a local man propositions Egan, he gets both the kind of trouble you’d expect, and truckloads of the kind you won’t see coming. Easily my favorite story of the issue, this well told tale generates its surprises the old fashioned way: from the characters and their situation. Now may we have the drum roll please? Presenting the Black Gate Fantasy Classic… “Tumithak in Shawm” by Charles R. Tanner. Tumithak, a barbarian of the tunnels, returns once again to the Surface, and the shelk invaders whose advanced technology has sent men deep below for five thousand years. This is a long piece, reprinted from the early 1930’s, and I’m not sure how the style meets today’s reader. Still, I’m hooked. The action is full bore: narrow escapes, rescued companions and dead shelk. Black Gate is a bucket load of reading — over 200 pages. This is a beautiful magazine with high production values. 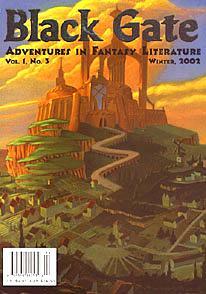 This issue contained reviews of recent fantasy titles as well as fiction. It also has excellent capsule reviews of fantasy role playing games and gaming aids, both current and historical, media tie-ins such as books written in the FRPG Forgotten Realms; and a fascinating review of spellcasting in the DC comics universe by Claude Lalumiere. The emphasis on how the past of the field relates to the present is presented with love and care in a way that makes sense. A young woman and her barbarian protector stumble across an ancient horror in a ruined temple… a group of children are trapped by the lethal remnant of a sorcerous war… a young explorer undertakes a dangerous journey to Earth’s surface, untold centuries after an alien conquest… and the last survivor of a race of shape-shifters faces an unexpected fate in the bloody coliseum of Ancient Rome. These and many more exciting stories await you in the big spring issue of Black Gate. This issue features fiction from Bram Stoker Award-winning author Brian A. Hopkins, a chilling new horror novella from Todd McAulty, and great new fiction from Don Bassingthwaite, Michael H. Payne, Jennifer Busick and many others. And don’t miss the hilarious exploits of the Knights of the Dinner Table by Jolly R. Blackburn! The Spring Black Gate [contains] serious work… such as “North” by the stylish Brian A. Hopkins, the tale of a blind boy rediscovering his bearings with the help of a kindly Native American, and the excellent “There’s a Hole in October” by Todd McAulty, a notable new voice in short fantasy. McAulty’s narrative of a Canadian man trying to import drugs into the US but instead becoming embroiled in ferocious supernatural intrigues — and in as tense a road chase as genre fiction affords — is magnificent storytelling, begging expansion into a novel. Of course, the subtext is a moral and spirtual malaize menacing the very survival of the modern world… the color of the month is funeral black. “There’s a Hole in October” by Todd McAulty [features] Pierre Lassiter, relaxing at a cafe before crossing the border into Canada. The crossing would be a lot easier if he wasn’t 5% caffeine by volume and if he didn’t have $15,000 worth of drugs in his trunk. He’s so stressed that he’s sure he’ll blow the customs check at the border when a bunch of young kids hit Lassiter up for a ride. They’re in trouble and Lassiter can’t bring himself to say “no.” What they haven’t told Lassiter is their last ride — a trucker — just died in a fireball wreck. Smooth, easy prose, a hero who declares his own life as “dogshit” with an attitude that probably keeps even him guessing whether he’s going to do the right thing made this a surprisingly enjoyable story, one of my favorite stories so far this year. Todd McAulty’s ear for his characters, especially Lassiter, made this thoroughly enjoyable. [In] “La Desterra” by Jennifer Busick, Esther Martin is a mage, traveling under an assumed name. When her ship is attacked by pirates, her crewmates hand her over. Aboard La Desterra, she tries to conceal her gender while frustrating the designs of her captors as much as she dares. It’s a wonderfully drawn alternate universe with engaging characters. Jennifer Busick’s treatment of magic is unique and compelling. A story that I greatly enjoyed…. Esther is a strong, vital and engaging character. [In] “Barbarian Instinct” by Don Bassingthwaite, Cacia is a loved and indulged daughter of a well-respected city merchant. Pawel is the barbarian fighter hired to guard her and guide her from the city to safety. When the invading Arkins find their trail, the two unlikely companions will have to overcome their differences in order to escape and survive. Cacia and Pawel are both engaging characters, their situation is credible, their interaction set off sparks and their ultimate acceptance of the value of the other feels solid. A nice tale well told. “Tumithak of the Corridors” by Charles R. Tanner is straight out action, but I was pleasantly surprised as how well Charles R. Tanner was able to sustain the reader’s interest with… narrow escapes and risky ventures. Man has been driven underground by the technologically superior shelk, invaders from Venus. Thumiak will face numerous challenges, not the least of which will be other humans in their variety of responses to the shelk threat. Tumithak is an intelligent barbarian of the tunnels, a worthy companion to Conan and Tarzan, and his quest is to rouse humanity and save the planet. Black Gate is a cornucopia of reading — over 200 pages. This is a beautiful magazine with high production values. Easy to read. I admired and enjoyed the dedication to adventure literature as more than either “then” or “now,” but a field of depth and history. Of course this issue contained reviews of recent fantasy releases [and] excellent capsule reviews of fantasy role playing games, both current and historical. Once again Black Gate faithfully fulfills its mission statement: “adventures in fantasy literature.” “The Mourning Trees,” by Peadar Ãƒâ€œ GuilÃƒÂ­n, is built around a compelling idea: sweet-smelling trees, created as a weapon during a recent mage war, nourish themselves by drawing people nigh so they can catch and slowly digest them. Moya, a poor and abused young housewife, is determined to save her darling boy Owen, recently grabbed by a tree — even if it means daring the city, and the magic rumored to be stored under the powerful and mysterious university. The issue hits its high point with “There’s a Hole in October,” by Todd McAulty. Those who read his debut story, the superb “Haunting of Cold Harbor” in Black Gate #3, will be expecting another riveting tale and this one does not disappoint. The time is a cold October during which a local rash of child murders have taken place, the place the Canadian side of the border just above Michigan, the problem a young man, Pierre, who intends to cross the border with 1500 bux worth of “pure,” in order to solve his financial problems. Pierre is extraordinarily nervous as he sits brooding in a coffee shop before commencing the final run to the border. This is not the time for Pierre to be approached by a seven-year-old boy named Eric who begs for a ride. Pierre finds himself agreeing to take not just Eric but several other kids .. about the time Pierre discovers there is something not quite right about the kids, they pass a horrible wreck-and the three-year-old informs them that the dead driver is their previous ride… the pace accelerates from there. McAulty’s characters are memorable, his voice sure, the story impossible to outguess — the ending carries well beyond the last line. The writing in Jennifer Busick’s “La Desterrada” is strong, as are the characterizations… ‘John Martin’ is a fire magus, taken prisoner aboard a Spanish privateer, and given the choice of death or service. When an English sloop attacks, the cannon-fire makes it nearly impossible for the magus to act… quite satisfying. 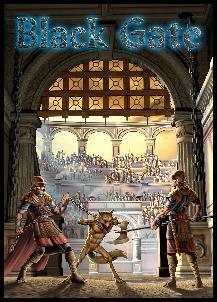 “Barbarian Instinct,” by Don Bassingthwaite [features] a bitchy female of class up against a stoic male who is loyal and true, and throws them into adventure… the ending jumps the fence with flair and wit. “Two-Skins,” by Shawn L. Johnson is a poignantly satisfying tale of a boy forced into the arena to fight against a wild animal while humans watch him die. Interspersed with his wait for what he knows will be his first and last battle is the story of his people, who have been conquered by the humans. Johnson keeps the pace accelerating and the emotions intense straight to the end. Do not miss the comic at the end, brought to you by “Knights of the Dinner Table.” If you are an inveterate fantasy reader, make certain that your beverage of choice is placed upon the table, and not imparting a healthy sip, or the rain in Spain will be delivered all over your copy. Black Gate prides itself in bringing the widest range of Fantasy to its readers and this issues maintains this reputation. The stories range from animal tales to dark fantasy and a couple of reprints that are certainly worth reading. Peadar Ãƒâ€œ GuilÃƒÂ­n’s tale concerns a mother’s attempt to rescue her son from “The Mourning Trees,” the remnant from the Sorcerer’s War… GuilÃƒÂ­n puts together a tale which works in its own fashion, maintaining its own pace and Romanticism. Joseph A. Cullough’s “Stand at Llieva” is an historical tale in which a small band find themselves trying to stay alive until the morning when they can escape. Ostensibly a beast tale, Michael H. Payne’s “Law and Order” is a story of justice and vengeance which plays with its own construction and becomes greater than the sum of its parts, somehow reminiscent of Lucius Shepard, as Leopard has to save two kits from the Blood Jaguar. Jennifer Busick’s “La Desterrada” takes us on a pirate ship with a mage who is not quite who they seem… told in an engaging fashion that rips along, with some nice little details than an attentive reader will enjoy. Don Bassingthwaite’s “Barbarian Instinct”… is his first foray into the realms of Sword and Sorcery. Cacia and Pawel the Barbarian are trying to escape to Gabria when they are captured. This promises to be the first of many tales with Cacia and Pawel. The story builds up neatly to its climax and follows a neat little Sword & Sorcery path. The second reprint is from Charles Tanner, a pulp writer active between 1930 and 1953, and introduces “Tumithek of the Corridors.” Rattling along with a fair pace, the story also brings in aspects of Science Fantasy and is highly enjoyable, and makes one think about how the short story practices have changed over the last fifty years. Black Gate focuses on written fantasy, and is a magazine that should be read for the bredth of coverage that it offers. One of the best side effects of the appearance of a new magazine, with a different editorial outlook, can be the discovery of new writers. Black Gate‘s most intriguing discovery is Canadian writer Todd McAulty. His first sale, “The Haunting of Cold Harbour” (Black Gate, Spring 2002) attracted plenty of praise, and he’s back in the Spring 2003 issue with “There’s a Hole in October.” A truck driver in Ontario, heading to the US with some illegal drugs, unwillingly picks up some unusual children at a restaurant. He thinks his problems are confined to how to sneak them and his cargo past customs. But the children seem to be fleeing another man, and also seem to have unusual abilities. McAulty ups the ante a few more times by the end, and adds a smart twist or two. The story is exciting, scary, and resolved ambigiously and honestly. He’s a writer to keep an eye on. This issue, Black Gate‘s fifth, is easily the best of the lot. Editor John O’Neill is showing a deft touch in his development of talented new writers… I should not be at all surprised if more than one of these works were to be found competing for genre awards at the end of the year, such is the quality of the writing. Black Gate is excellent value for the money. I’ve subscribed to it; if you enjoy fantasy fiction that is more interested in the story and the characters than structural posturing, you really should too. “Stand at Llieva” is an excellent piece of magically tinged military fiction, tautly written and compelling throughout. The combination of Spanish Conquest era weaponry and battle magic was intriguing and I’d like to see the concept developed further. Michael Payne’s “Law and Justice,” set in the same world as his Blood Jaguar… is highly original and is told in an easy, relaxed style that fit the setting nicely. Don Bassingthwaite’s “Barbarian Instinct”… I quite enjoyed, and its conclusion is bang-up great. I found [Brian A. Hopkin’s] “North” a complete success, full of the deep pathos for which the author overtly aims. It is sad, yet bordering on uplifting, and its chilling lupine metaphor leaves one afterward with much the same unsettled feeling as one of de Maupassant’s darker stories. 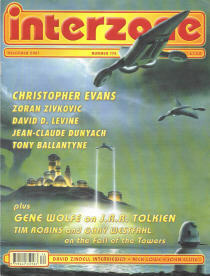 My favorite [short story] in this issue was the cover story, “Two-skins” in which Shawn Johnson shows how the gladitorial entertainment of Rome might have looked from a participant’s perspective, if Rome was not bordered by naked, sword-wielding Gauls, but nature-centric shape-changers instead. The story is powerfully emotional, full of action, and leaves one with a real sense of somber satisfaction. The classic reprint, “Tumithak of the Corridors” serves as reminder of how far the fantasy genre has come in its craft, and how much it has lost in its spirit and understanding of the great themes of literature. Tumithak is not out to discover himself, nor does he go on a journey to learn that he really just has to learn to be true to his feelings, he is instead a true hero, a giver of hope to the downtrodden and an exemplary defier of overpowering evil. And Todd McAulty goes from strength to strength in “There’s a Hole in October,” proving that he is rapidly becoming an author with whom to reckon. This tale of supernaturally-gifted children on the run from an inhuman malevolence is ominous and exciting, with excellent characterization, pace and action. I am extremely impressed by this guy, who in his first two publications has set himself a tough standard to uphold. Here’s hoping he does it! McAulty is definitely a writer to watch. Bassingthwaite’s section on roleplaying games is as in-depth and comprehensive as before, and as his short story in this issue shows, he is an engaging writer. One only wonders where he finds the time for all this RPG reading, much less playing. [Claude] Lalumiere’s “The Comics Cauldron” is as esoteric as ever… and the [Knights of the Dinner Table] comic Java Joint, quite simply, rules. A Chicago pub where the ghosts of Blues legends gather to swap tales and jam one final time… a post-apocalyptic cityscape where automated bombers still cruise overhead and the last rock band hears the sound of extinction… a wild west where a trio of demons test the wits of a lone bounty hunter… and the dungeons of Chateau Machecoul, where an aging knight comes face-to-face with a horror unlike anything he’s ever known. This issue featured the start of a major fantasy series from Hugo Award-winning author Bill Johnson and a new novelette from epic fantasy novelist David B. Coe, as well as fiction from Cory Doctorow, Tina Jens, Mark McLaughlin, Patrice Sarath, Keith Allen Daniels, and many others. And don’t miss the return of the hilarious Knights of the Dinner Table comic by Jolly R. Blackburn! Our special feature this issue is “Playing the Classics” by Kyla Ward, a detailed survey of role-playing games based on classic works of fantasy, including Fritz Leiber’s Lankhmar; Michael Moorcock’s Hawkmoon, Corum and Elric volumes; Roger Zelazny’s Amber; Andre Norton’s Witch World, and of course Tolkien’s Middle Earth and H. P. Lovecraft’s Cthulhu mythos — as well as popular and rare games inspired by the works of Robert E. Howard, Terry Pratchett, and Jack Vance. 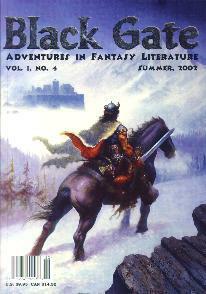 Black Gate is one of the most exciting things to appear in the fantasy genre in quite some time… Unlike other genre mags, Black Gate unapologetically embraces the pulp roots of the genre and returns the focus from self-conscious literary exercises… in favor of what editor John O’Neill describes as adventure fantasy. In other words, its the storytelling, stupid! The magazine is a fat 208 pages of straightforward fantasy fiction, game reviews and book reviews… It is, in short, exactly what one would want a magazine devoted to fantasy fiction to be. The production quality is high, the cover art is colorful and better than most fantasy novels published today and the fiction is entertaining, well-written and surprisingly solid from first to last… excellent value for the money. I haven’t had a subscription to a fantasy or science fiction magazine since letting my subscription to Asimov’s lapse, but I’ve not only signed up for this one, I’ve hunted down the first three issues as well. I was quite taken with “A Prayer for Captain La Hire” by Patrice Sarath, which delves into some of the darkness and despair that surrounded the downfall of Joan of Arc. The characters are vivid and the story conveys a strong sense of history… I have always enjoyed stories in which there is a confluence of reality and game reality, and Bill Johnson’s “Mama Told Me Not To Come” is one of the best of this sort since [Joel] Rosenberg… a fantasy quest with thriller elements. The columns and reviews are uniformly excellent. Don Bassingthwaite writes one of the longest and best game review columns I’ve ever read, (13 pages! ), concentrating primarily on RPG books. [In] The Comics Cauldron Claude Lalumiere writes in an engaging style and… Kyla Ward’s piece on role-playing in classic environments was interesting, as I had no idea anyone had ever developed an Amber RPG. Java Joint is one of the funniest comic strips I’ve ever read, I mean, for fantasists, it’s up there with Calvin and Hobbes, Bloom County and The Far Side. Black Gate is thick, halfway between a trade paperback and a regular magazine. The covers are beautiful, both in terms of the art and the production…. There is a lot of art inside, all black-and-white or grayscale, and … It is certainly head-and-shoulders above the cheap and miniaturized format of the Analog/Asimov/F&SF mags. Black Gate for Summer 2002 is entertaining, ranging the gamut for fantastic forms; this issue’s high points are “Beat Me Daddy (Eight to the Bar)” by Cory Doctorow… [with] amateur musicians surviving and then transcending the collapse of Western Civilization, and “The Loiterer in the Lobby” by Michael Kaufmann and Mark McLaughlin, one of the better recent spoofs on H. P. Lovecraft, [with] Cthuloid conspiracies and revolting deformities overshadowing a young man’s search for job satisfaction in contemporary or near-future Arkham. I’ve never wondered exactly how a Wild West gunslinger would behave if summoned to another universe to slay demons, but now that I have read David W. Hill’s “Far from Laredo,” I have a better idea. Charles Duke finds himself one day rather far indeed from Laredo, inadvertently summoned to rid a village of the three demons who haunt it. With a stoic bloodthirstiness worthy of Clint Eastwood, Duke takes care of the demons and rides off with saddlebags of gold. The ending makes it clear that this will be the first in a series… it’s a promising beginning. Part of Tina L. Jens’s Lonesome Blues Pub series, “Stranger Ev’rywhere” is a rambling tale of one night’s events at said pub, owned by Miss Mustang, where the clientele includes both drunken college students and the ghosts of various legendary blues musicians. Harpsicrazy, a regular, is no ghost, but suffers from the results of a botched frontal lobotomy. The only thing that will settle him down is playing the blues on his harmonica. When a college student plays a cruel prank on Harpsicrazy, only the musical efforts of the pub’s occult clientele can prevent Harpsicrazy from going berserk and destroying the pub. Jens’s story is drenched in the lore and legends of the blues, and she effectively cuts between Miss Mustang’s resigned and Harpsicrazy’s surreally distorted perspectives. [In] Bill Johnson’s “Mama Told Me Not to Come”… Johnson has taken the original tack of using a multiplayer online role-playing game, such as EverQuest or Ultima Online, as the setting for his story, and Sir Linux, a self-aware character in the game, as the hero.. Johnson doesn’t seem to have quite as high a profile as he deserves, though he did win a Hugo a couple years back, and this story is up to his usual high standards. Black Gate… seems to be finding its voice; well-written adventure stories that are not afraid to explore both character and idea. I believe that “Night of Two Moons” is popular fantasy author David B. Coe’s first entry in short fiction. The story opens with Carthach, a mage-warrior, wandering a battlefield while thinking of the next day’s attack…. The story is dramatic, grim, moody; on the surface it’s an adventure story concerning a war between two kingdoms, but the story is really about bravery and cowardice — treachery and motivation. Anyone who recognizes the name Gilles de Rais will immediately suspect that Patrice E. Sarath’s “A Prayer for Captain La Hire” is not going to be a light-hearted comedy. It’s ten years after the Maid of Orleans was captured by the English… [when La Hire] receives a message from his old colleague-in-arms, Gilles de Rais, and despite some disquieting rumors, and the warnings of his friends de Metz and de Poulengy, sets out to see what de Rais needs. A swift, unpredictable roller coaster of a story, highlighted with just the right amount of wryness, this was one of my favorites in a strong issue. Bill Johnson’s bravura “Mama Told Me Not to Come” opens with a warrior in the midst of battle with an unnamed foe… The scene widens to include his trusty sidekick Iago, who takes care of logistics while Sir Linux fights — and fights and fights. He goes to a bar, and just about the time the reader has sussed out the story (oh, right, we’re in some kind of computer wargame world) Johnson jumbles the elements and the story gleefully takes off at right angles. Players, Makers, Daemons, and Voices are not what you assume they are, and furthermore, the dividing line between QuestWorld, ours, and what might be another dimension to both of them also makes a few tectonic shifts. The writing is splendid, the characters engaging, and the story satisfies the adventure-craving reader without ever becoming predictable. There are also comics, poetry, and various sorts of reviews. The issue is 208 pages — a book, really — and that means 208 pages, not 160 pages plus a wasteland of ads. Readers who like “something to happen” in well-written speculative fiction ought to be seeking out Black Gate. I guess you could fairly say that we are enamored with the magazine… Issue #4 is a great read from cover to cover and, as usual, the pub is brilliantly visual with haunting interior art, author photos, comics, and pleasurably readable type. The fiction is likewise spellbinding. Patrice E. Sarath’s story, “A Prayer for Captain La Hire”… picks up where your high school history books leave off and follows the guilt-ridden and world-weary exploits of two knights who once fought beside the Maid. One has become a mercenary – and one, Marechal De Rais (the real life inspiration for the legend of Bluebeard) has become a demonic enemy, tortured by both a lust for power and a longing for Salvation. Fifteenth century France is alive and rife with mystical fire in this impressive story, which is both an adventure tale and a morale parable. Highly recommended. In fact, we’d recommend the entire issue of Black Gate #4… [though] don’t expect every story — or even most of them — to feature swords, spells, and knights in armor. Instead, expect your vision of Fantasy fiction to be challenged and enlarged by some of the most imaginative and technically proficient storytellers the genre has to offer. Black Gate is a showcase for mainstream fantasy and simple, effective storytelling is the key… in Bill Johnson’s story, “Mama Told Me Not to Come.” Sir Linux and his trusty sidekick Iago are two self-aware NPCs trying to dodge the blades of Players who want to kill them for the experience points, while at the same time searching for a kind of NPC Eden they think they can reach through a magic mirror… For an old gamer like me, Johnson’s story hit the basilisk on the head. In “The Loiterer in the Lobby” Michael Kaufmann and Mark McLaughlin have come up with an amusingly cornball story of tempting, demons and pizza…. the wry yarnspinning and lack of serious intent work to great effect. Cory Doctorow’s “Beat Me Daddy (Eight to the Bar)” is good stuff too… the apocalypse and its aftermath has been done before, but rarely this stylishly. “A Prayer for Captain La Hire” by Patrice E. Sarath is an assured and engrossing tale set in the France of Jeanne d’Arc… Sarath’s style is simple and beguiling, and a history lesson to boot. Did you know that Gilles de Rais became involved in witchcraft, cannibalism and necrophilia? Black Gate avowedly tries to publish more traditional adventure-oriented fantasy… the best story, though, is Cory Doctorow’s “Beat Me Daddy (Eight to the Bar),” a post holocaust tale… A group of people are scratching out a living by scavenging the ruins of a “dresdenned” city. The narrator is a trumpet player in a casual band that represents the closest thing to a real community around. When a young woman shows up and tries to get the locals to start growing plants instead of scavenging, there is some surprising resistance. The characters are well-drawn, and the central issue thought-provoking. An American pilgrim faces a demonic challenge on a cold winter night… a dwarven detective stumbles on an ingenious new scam in a very old casino… a deadly worm terrorizes the helpless inhabitants of an ancient sky city… and the Lord of the Underworld tracks a child murderer across a chilling landscape where spiders lurk in hidden lairs and ghosts are hunted for sport — all in the big Winter installment of Black Gate. This issue features a brand new piece in the popular fantasy detective series from multiple Hugo Award Winner Mike Resnick; a chilling tale of black magic on the American frontier from Weird Tales editor Darrell Schweitzer, an action-filled re-telling of the first meeting between Lancelot and Oberon from Forgotten Realms author Elaine Cunningham, and the return of Harry James Connolly, author of “The Whoremaster of Pald,” with a brand new Pald story. Our special gaming feature is an in-depth look at the recent D&D adventures from KenzerCo and Wizards of the Coast, and d20 modules from Privateer Press, Green Ronin, and others. This month’s column is a bit of a treat… the [magazine] I just found is a real pleasure. Black Gate is a slick publication, measuring ten inches by seven inches and — brace yourself for this — more than 200 pages long! That’s right: each issue has enough short stories to be a paperback anthology in itself… the eleven (!) stories in this issue each [have] at least two quality illustrations that are even better than the ones you would find in Asimov’s. I can’t help but gush over such a lovely publication. Just looking at it is a pleasure. I was almost afraid to actual read the issue, in case the stories didn’t live up to their packaging. Thankfully, they did. The next story — this issue’s longest — is by far the best. “The Haunting of Cold Harbour” by newcomer Todd McAulty takes place in a VR (virtual reality) world of the near future when society is in another Great Depression and has retreated to VR worlds for comfort and solace. In one particular VR world, the Cold Harbour of the title, strange things are afoot. In a world of ghouls and gremlins, a mass murderer is loose and is killing child characters. Sammy Ron, the executive of the company that produces and maintains Cold Harbour who is responsible for the world, is given the task of finding the murderer before the news leaks out and the world is shut down. This story is enjoyable because it works on so many levels. On the surface, it’s a fun and well-written near-future dystopia. But it’s also a mystery, as well as tipping its hat to cyberpunk. Dig a little deeper, however, and it begins to reveal itself as a meditation on the essence of reality. Brian McNaughton’s “Ringard and Dendra”… takes place in the fantasy world of Seelura. Ringard is a poor peasant’s son who falls in love with the Lady Dendra. They run away to create a life of their own, away from the expectations of their positions that society has placed on them. However, Dendra comes under a curse… The horror here is subtle and is thus all the more terrifying. “For the Love of Katie” by Gail Sproule, is a tale about genetically engineered dragons that also explores the ways in which bonds of love often cause us to look inside ourselves to tap potential we didn’t know we had. It’s a pleasant and relaxing end to a wonderful issue. This was the first issue of Black Gate I’ve read… and if it’s indicative of the magazine, I’ll be picking up the other issues, and subscribing. At 226 pages, Black Gate is a big read. Lurking behind the glossily attractive cover lies a wealth of fiction, reviews and articles, all focused on the fantasy genre. The text is well laid out and printed on good quality paper, and the magazine has black and white illustrations throughout. There are eleven stories in this issue, spanning the breadth of the fantasy world. You will find sword and sorcery, knights in armour, and also postmodernist humour. The issue kicks off with ElizaBeth Gilligan’s “Iron Joan” The title is presumably an ironic pun on the 1990’s American bestseller concerning the mythology of the modern male, Iron John, as there’s more than a hint of feminist politics in the story… it seems that in this particular fantasy world, sisters are certainly capable of doing it for themselves, with perhaps a little help from the occasional dragon. By way of total contrast, Ellen Klages story “A Taste of Summer,” is set in 1960s America. There’s a whiff of Ray Bradbury-style nostalgia to this tale, and maybe even a hint of Stephen King. This is readable, entertaining fantasy as its best. “Three Nights in Big Rock City” by Jon Hansen is a romp, as a bearded female private detective is called upon to assist an elf… Darrell Schweitzer’s “A Dark Miracle” takes us firmly into Nathaniel Hawthorne territory… There is a strong sense of early American history, with settlers perched on the coast of an unknown and terrifying continent. Excellent stuff. The other seven tales cover a diverse spectrum of the fantastic, taking in Virtual Reality, a dream-thief, and Arthurian Britain along the way. The quality is remarkably consistent… The magazine also contains several lengthy articles, each one dealing with a different aspect of fantasy. My overall impression of Black Gate is very positive… it may well evolve into a ‘must read’ for all fans of the fantasy scene. Black Gate is expansive… with well over 200 generously-proportioned pages, and contributions by Mike Resnick and Darrell Schweitzer, it has heft. The best stories in the Winter 2002 issue are by newcomers, however: “A Taste of Summer” by Ellen Klages, a neatly nuanced Bradburyesque relation of a child’s adventures in the company of an ice-cream confectioner; and the genuinely arresting “The Haunting of Cold Harbour,” by Todd McAulty, a baroque vision of serial killings in a Virtual Reality World that sounds well worth visiting, a place of ghouls and garish combats… A novel probably beckons, and it’s a prospect to relish. This is the first issue of Black Gate I’ve gotten my hands on. These guys aren’t kidding around. This heavy-duty volume, bigger than many trade paperbacks, is very classy. It’s got a gorgeous wrap-around cover illustration (by Hung Vinh Mac), a clean layout, and nice touches like author bios (with photos) alongside each story. This one issue alone contains ten new stories and one classic reprint, plus a survey of current fantasy magazines, game reviews, book reviews, young adult book reviews, and a history of comic books. “Three Nights in Big Rock City” by Jon Hansen is lighthearted and charming. It features a dwarven private detective named Joe, who also happens to be female (though “most men see my beard and assume I’m a guy”). She is hired.. to retrieve a magical item, a wooden rod with a gem at one end. Joe recognizes the item immediately–“A McGuffin.” …The story involves a suitable number of twists, double-crosses, and plenty of magic. Lots of fun. “The Chinese Sandman” by Mike Resnick features the return of detective John Justin Mallory, who first appeared in Resnick’s novel Stalking the Unicorn. When Mallory’s partner Winnifred reveals that she regrets having traded a cherished memory to the Chinese Sandman, who deals in dreams and won’t give it back, Mallory takes along the catlike Felina and sets off to enlist the aid of his arch-nemesis, a demon named the Grundy. This light piece is a nonstop avalanche of quips, puns, comebacks, one-liners, and groaners… Mallory is a detective in the Sam Spade mode — unperturbable, and so impressive that even his enemies fawn over him. This issue’s classic reprint is “Ringard and Dendra” by Brian McNaughton… This story really is a classic. Ringard is a poor boy with a gift for seeing shapes within wood, and carving them free. In the forest he meets a young noblewoman, Dendra, who has a skill for painting. Together, they spend their days carving and painting small statuettes… until they encounter a patron, the mysterious and sorcerous Dwelphorn Thooz, who keeps a strange garden. As Ringard and Dendra fall further and further under the wizard’s spell, the story becomes a vividly grotesque tour-de-force of magical horror. If your taste in fantasy runs more towards the swords, spells, and monsters end of the spectrum, I would definitely give [Black Gate] a look. 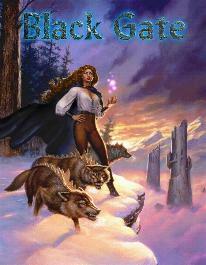 I love good adventure fantasy fiction, and have for forty years… Black Gate promises to be what I’ve been looking for. In issue #2 Harry James Connolly made his fictional debut with the nifty “Whoremaster of Pald.” In this his second story, he returns to Pald, this time to tell the story of Jebul, a cart-puller, who encounters a magical sword that cannot be defeated. Connolly spins this story out in vivid prose with evocative detail, a deft hand with character, and fast pacing. You cannot guess the end until it hits you. The next story is a spectacular change of pace. One of the best stories in the issue, Ellen Klages’ “A Taste of Summer” gives us Mattie, a little girl at a lakeside resort… a storm swiftly blows up into something dangerous, and Mattie takes refuge in the ice cream parlor. The story is subtle, beautifully written, with eddying complexities that are not pattly explained. Though the story could easily be labeled mainstream — or even science fiction, with its element of chemistry — the adventure is a real adventure, the sort that a nine-year-old girl might just have, and remember as especially magical all her life. [Todd McAulty’s] “The Haunting of Cold Harbour” ought to appeal to all readership; its virtual gaming world will be breathtakingly innovative for a new reader… The story opens with the protagonist, Sammy Ron, about to blow up a hotel room. His associate discovers something nasty instead of the target, and as a result Sammy blows up the entire hotel… The existence of Cold Harbour is threatened, there’s a nasty killer on the loose, and Sammy has to call on some very strange beings indeed, including some AIs who may or may not be “real,” in and out of the virtual world. The pacing is frenetic, the voice strong and vivid, the characters fascinating. I reached the end wishing that this were a novel. Hard to believe that this is McAulty’s first fiction sale. Other features include reviews of gaming venues, novels, and sister magazines that contain fantasy. What I considered the highlight of the reviews was Victoria Strauss’s excellent take on recent fantasy novels for young readers. There are far too few places where one can find good reviews of children’s fantasy. [Black Gate‘s] appeal is broad, the emphasis strongly on story and character; [and] there is a perceivable place for this magazine in today’s market. If you like adventures in fantasy literature, I recommend Black Gate. Review by Daniel E. Blackston and Lady E.
“[Black Gate] launched under a confetti-storm of amorous praises, and these praises have continued. No doubt, Black Gate is the handsomest of print pubs. The magazine is a joy to hold and behold… issue #3 is an outstanding visual triumph and won’t bore your eyes. “Iron Joan”, by ElizaBeth Gilligan, typifies two prominent features of the fiction in issue #3: a theme of loneliness and ÃƒÂ©migrÃƒÂ©, and consummate prose. In graceful, fluid style, “Iron Joan” weaves a tale of an exiled noblewoman who incomprehensively forfeits life on her father’s lands amid his plundered riches to scrape out an existence in a scrubby medieval village… [until] Iron Joan’s father, The High Chieftain of Glen Cluain, arrives with an armed host to reclaim his daughter and her first-born son… A deep, well-written tale. Highly recommended. [Some] stories stray far from the realm of Sword and Sorcery… best of these is “A Dark Miracle” by Darrell Schweitzer. We promise you — you will be chilled after you read this tale. This Gothic jewel is simply spellbinding and forges Cotton Mather, H. P. Lovecraft, and Nathaniel Hawthorne into a truly Black Gate… Wakened in the dead of night by his witch-mistress’s familiar (in semblance of a rat with an old man’s face), Goodman Hawkins leaves his sleeping wife and journeys out into the snowy night to answer the summons of his illicit ladylove, [only] to find her murdered… Schweitzer is poetic to brilliant in this Gothic tale. After reading “A Dark Miracle”, yours truly felt he had glimpsed something truly Awful… This mini-masterpiece is a must-have for Schweitzer’s loyal followers. The theme of outsider and exile is brought to a truly emotional climax by Michael R. Gist’s, “Tav Ru’s Troth”, a moving, from-the-beast’s POV story of compassion and heroic selflessness. We can’t remember ever reading a story this short that evoked such a powerful theme of Otherness. Gist writes tenderly and convincingly of his monster… This story will move readers deeply and send them looking for more of Grist’s work. You won’t find a better looking or more professionally written pub. In addition to fiction, Black Gate offers reviews of short fiction publications and a look at comics and role-playing games… the literary standards, production value, and generously-heaped content of Black Gate are unparalleled in the SF field. A lonely gargoyle guards a vampire’s tomb… a pair of resourceful refugees come face-to-face with demonic possession in 1945 Shanghai… a Mayan princess seeks a magical cure for her ailing father… and a courageous swordswoman confronts the curse of a dying sorcerer — all in the big Summer issue of Black Gate. Devon Monk’s poignant tale of a young woman coping with a powerful and dangerous magical gift, “Stitchery,” was selected by David Hartwell and Kathryn Cramer for the 2002 edition of the Year’s Best Fantasy. Also this issue we presented the fiction debut of Harry James Connolly with the popular “The Whoremaster of Pald,” a tale of intrigue and magic in a decadent port, and our Fantasy Classic feature was Edmond Hamilton’s chilling tale of ancient horror in the desert, “The Monster-God of Mamurth,” from the 1926 Weird Tales. Also featured are Nebula Award-winner Leslie What, World Fantasy Award-winner Rick Bowes, and many more. In our departments Jayme Lynn Blaschke interviews Gene Wolfe, Claude Lalumiere looks at the comics of Alan Moore, and Rich Horton does an exhaustive survey of the best fantasy anthologies of the last five decades — and don’t miss the brand new Knights of the Dinner Table comic strip by Jolly R. Blackburn! All told over 125,000 words are crammed between the covers, covering the very best in the fantasy genre. An ambitious new magazine bursts onto the stands. Black Gate stakes out all fantasy in the printed form as its territory… fiction, some comic strips and interviews, along with reviews of books, comics, and role playing games. Whew! The 7″x10″ size gives Black Gate a wonderful retro feel. It actually matches the dimensions of a 1934 copy of Wonder Stories. The paper quality of Black Gate is superior of course — this isn’t a pulp magazine — but it’s an attempt to revive the species in a modern context. At 224 pages, issues 2 packs a lot in, including a Weird Tales reprint from 1926. This is a real treat… Black Gate adds an impressive attention to detail in story presentation. Along with 4 new illustrations and author photo, there are text sidebars relating a short biography of Hamilton, together with photos of selected Hamilton books and pulp magazine covers. Memorable among the other 9 stories is “‘Goyles in the Hood” by Nebula Award winner Leslie What. This vampire tale features two gargoyles who guard the sanctuary of their vampire mistress… an original twist on a sub-genre in danger of becoming passe. Other stories of note include “Pity the Poor Dybbuk” by Steve Carper and “Heart of Jade” by Amy Sterling Casil… Casil’s story traces the destruction of pre-Columbian Mayan culture, seen through the eyes of a feisty Mayan Princess and an artisan who makes an unlikely but credible hero. Black Gate goes beyond a fiction magazine. Indeed, a third of issue 2 consists of articles, reviews, columns and a Gene Wolfe interview by Jayme Lynn Blaschke. As promised in the editorial, Black Gate is on a mission to inform — all the stops are pulled out, starting with an article on “Building the Fantasy Canon: The Classic Anthologies of Genre Fantasy” by Richard Horton. Apart from giving a sense of historical perspective to this new magazine, it provides a useful reference for those interested in reading more genre fantasy. Does Black Gate deliver? In spades! It clearly intends to be a professional player in the field. “The Whoremaster of Pald” by Harry James Connolly is a deft weaving of character, plot, and circumstance… There’s politics afoot and the whoremaster has gotten on the wrong side of someone’s ‘to do’ list… The story has great depth as Connolly weaves in different backgrounds and cultures. The reader gets the sense that there is almost always more going on… Nicely done. ‘Stitchery’ by Devon Monk is a poignant story with a definite Frankenstein flavor. Tilly is a young woman trying to hold her farm together. Tilly also has an ability to create new beings from the flesh of old beings… it’s a dangerous thing, and when her helper falls dead Tilly is forced to make a decision. Monk really manages to pull off a wonderful story with some really wacked elements… Skillful writing and great story crafting. “Under the Bridge” by Jeff Verona is an updating of old folklore. Toni works in a convenience store fending off minors trying to buy cigarettes, gang members, and a life which seems to keep her on the wrong side of the tracks. One night Toni gets stood up and has to walk home. The cast of characters reappears looking for trouble and finds her… Verona did an excellent job of updating this piece of folklore. Nicely done. Generously illustrated with book covers, photographs and artwork, with clear print throughout and easy-on-the-eye layout, this newish magazine certainly looks impressive… On the fiction side of things there are ten stories, showcasing a satisfying diversity of themes and styles, but with quality as a defining factor throughout. “The Whoremaster of Pald” by Harry James Connolly has the pimp Zed, who’s really quite a nice guy despite his choice of profession, dealing with magic attacks and judicial enemies, a cleverly plotted and entertaining slice of hokum. In a darker vein, Jeff Verona’s “Under the Bridge” has gangbangers taught a short, sharp lesson, while the wry and ironic “Ã¢â‚¬â„¢Goyles in the Hood” by Leslie What sees two gargoyles set to guard a vampire’s lair coming to terms with the modern world… In the erotically charged “Heart of Jade” by Amy Sterling Casil we learn the fate of the Mayans, while “What They Did to my Father” by F. Brett Cox with its painful depiciton of childhood suffering shows the Klu Klux Klan in a different light. All of the stories entertain, and some of them do a bit more than that. Black Gate proves a satisfying and varied bill of fare, one guaranteed to send the punters away with a smile on their faces. “The Whoremaster of Pald” by Harry James Connolly (his first fiction sale) pulled me into this new fantasy magazine, and I kept going. With straightforward prose and subtle humor, Connolly winks his way through the dire predicament of the Whoremaster, imprisoned for murder. His business was doing well in the seedy Foreign Quarter, until the new Warden came along… Connolly weaves his story well, with an interesting chain of events [and] a satisfying ending. Black Gate covers “Adventure Fantasy”.. everything from work in the style of Terry Brooks to H. P. Lovecraft or Robert E. Howard. It also covers RPGs, youth fiction, comics, and pulps… a strong and broad mandate. How well does Black Gate pull it together? Extremely well. The range of stories is great. Some, like “The Whoremaster of Pald” are set in traditional high-fantasy worlds (though the setting of this particular piece is remarkably rich and textured), while others, like [F. Brett Cox’s] eerie “What They Did To My Father,” are contemporary. A few are in historical settings, such as [“Amy Sterling Casil’s”] Aztec epic “Heart of Jade.” All are well crafted… I can guarantee that if you like fantasy, you’ll find at least some you will absolutely love. I know I did. RPG reviews take up 26 pages, including a great essay on playing orcs… providing some of the most comprehensive rpg reviews I have read in a long time. I leave the inaugural issue of Black Gate with my thirst for fantasy sated and with a far greater appreciation for the breadth of the genre. Wonderful… fantasy fans couldn’t ask for a more comprehensive and worthwhile buy. Black Gate is a very promising addition to a lamentably dwindling number of genre magazines… at 224 pages, the magazine has all the heft of a good trade paperback. Along with the stories are an interview with Gene Wolfe, articles on gaming, comics, and books, including some excellent overviews of fantasy for adults and for young readers from Richard Horton and Victoria Strauss respectively. What I find to be the magazine’s biggest layout advantage is that each story runs uninterrupted… I really appreciate not having to play hunt-the-slipper halfway through a story. “Bones of the Dead,” by Julia Blackshear Kosatka, concerns an aging swordmistress who was once a part of the Queen’s Guard. Loyal to her monarch and her family, Rella got dragged into a war involving sorcery, and its aftermath. There are all the familiar elements here of adventure fantasy: other worlds, evil wizards, swordswomen, oaths and curses, but Kosatka’s story really is about time, and the strength of family bonds. It’s an ambitious tale, and a worthwhile read… its ending is poignant. 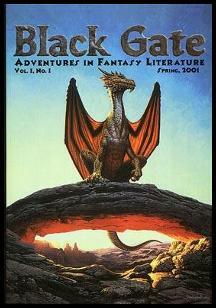 The premiere issue of Black Gate created a sensation. Wrapped in a cover by famed artist Keith Parkinson, this book-sized tome contained a brand new tale of the Eternal Champion from Michael Moorcock, as well as a Newford tale from Charles de Lint and original work from Jeffrey Ford, Paul J. McAuley, and many more. 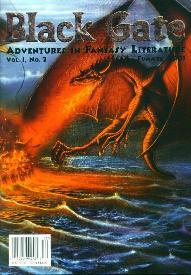 The lead story, Richard Parks’ “Golden Bell, Seven, & the Marquis of Zeng,” was selected for inclusion in The Year’s Best Fantasy, edited by David Hartwell, and Jeffrey Ford’s “Exo-Skeleton Town” was selected as a Recommended story by Locus magazine and reprinted in the splendid collection The Fantasy Writer’s Assistant, from Golden Gryphon Press. Also in this issue is “The Unlikely Case of News from the Edge,” a long feature from Mark Sumner on the bizarre experience of having his novel turned into a TV series; a nostalgic look at gaming by Todd Ruthman, “The Joy of Role Playing, or Why I Still Spend Thursday Nights in the Basement,” columns from Victoria Strauss (Young Adult fiction), Don Bassingthwaite (games), Claude Lalumiere (comics), and the launch of The Java Joint by Jolly R. Blackburn and Steve Johansson, a terrific new comic strip from the creators of Knights of the Dinner Table. The first issue features spectacular cover art by Keith Parkinson, and in addition to the high-quality fiction offerings, is stuffed with well-written book, comic, and gaming reviews and columns, & even a couple of comic strips. I particularly liked the “about the author” sidebars; each fiction author gets a photograph, along with a lengthy bio, and often a separate sidebar showcasing his other published work. This issue gets off to a great start with “Golden Bell, Seven, and the Marquis of Zeng” by Richard Parks. It’s a fairy tale set in ancient China, simply and elegantly told. Inspired by the discovery in modern times of the 3rd century BC tomb of the Marquis of Zeng, it follows the quest of a common man to rescue a beautiful consort of the dying Marquis before she is killed and buried in the tomb… We’re treated to hidden treasures, statues of men and monsters coming to life, and heavenly music before it’s all over. Altogether, Black Gate makes for very enjoyable reading; there’s bound to be something here to appeal to just about anyone interested in the literature of the fantastic. There’s fiction, too: a generous helping of Michael Moorcock’s The Dreamthief’s Daughter. ‘The Dark Muse’ by Karl Edward Wagner is dark, demonic… a gripping horror story not without pitch-black humour and maybe the best thing in the magazine. If all that isn’t too much, there’s also three pieces of mainstream, original short fiction. ‘Golden Bell, Seven and the Marquis of Zeng,’ by Richard Parks is a beguiling tale of magic, and more demons, from the Orient long ago… Written with finesse, it reads like a translation of an ancient Chinese fairy tale; the prose is deceptively elegant, and the story is filled with understated humour and invention. ‘Exo-Skeleton Town’ by Jeffrey Ford… is crazy stuff, man, witty and entertaining. Overall? It’s hard not to question its value. So much for not much, in a good-looking, easy to read format. All power to John O’Neill and Black Gate! The first [story] is an elegant Chinese fantasy by Richard Parks, “Golden Bell, Seven, and the Marquis of Zeng.” … it has moments of charm and depth, as when Seven perceives Golden Bell’s true beauty, and subsequently as he learns the difference between knowing someone and falling in love with an impression. Charles de Lint’s “Wingless Angels” is set in his familiar town of Newford, where a man finds a film canister laying in the street and decides to have it developed. When the photos show weird, slinking monsters attacking people, and have date stamps that extend into the future, he sets off to find one of the victims before he’s attacked… the author thoughtfully creates characters who are ready to apply the lessons they provide. Jeffrey Ford’s “Exo-Skeleton Town” is a ribald, scatological tale set on a dark planet populated by alien bugs whose medium of exchange is their own excrement in the form of dung balls. Humans have arrived in force, having learned 1) of the bugs passionate interest in old back & white movies; and 2) of the dung balls’ fantastic aphrodisiac powers. But wait, there’s more… lots of wacky fun. There are some thematic ironies that knit together the story’s various parts… it’s definitely alive. The premiere issue of this magazine starts out with a bang… it is an incredible 240 pages and is crammed with plenty of goodies, such as the excellent short story “Wingless Angels” by one of my favorite fantasy authors, Charles de Lint, a tale about finding a lost roll of film and what develops is purely magical and delightful. There is also a novel excerpt by one of my favorite British writers, Michael Moorcock: The Dreamthief’s Daughter, an alternate history thriller — clearly worth the price of the magazine alone. Plenty of good book and movie reviews, gaming reports, artwork and two funny comics: Knights of the Dinner Table: The Java Joint, and Albee Schwartz, Insurance Salesman to the Gods. Rating: Big, Bold & Beautiful!! !